What a lesson: Perfect, ultra-fresh need little - any? - adornment. The browned butter sauce is perfectly good - really good, in fact. But the asparagus were so perfect, all on their own, that the sauce actually detracted. 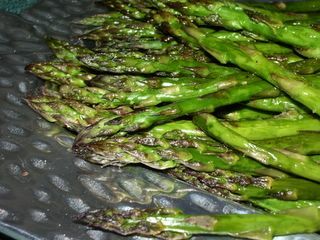 The roasting process (without the browned butter) is a great zero-point way to roast asparagus and presumably other vegetables. Usually it seems to take more oil than I'd like to coat vegetables headed to the oven for roasting AND it's sort of an oily mess, I usually just dig in with my hands for simplicity and speed. The cooking spray (or a mister with your own oil) makes light, er, work of the process and calorie impact. Preheat oven to 400F. Clean and trim asparagus, removing the woody ends. 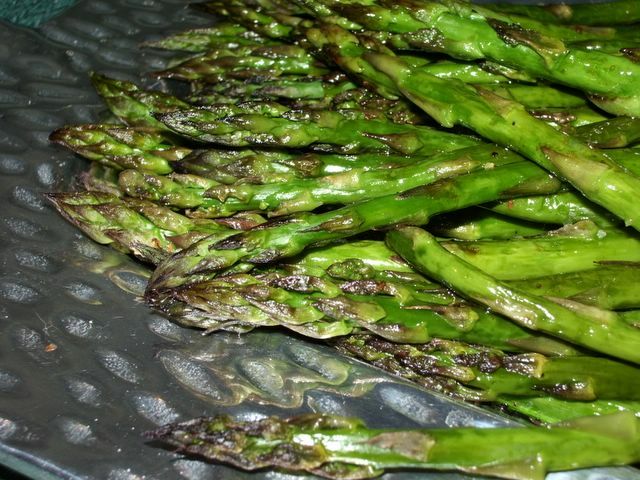 Place asparagus on a rimmed baking sheet in a single layer and mist with cooking spray. Apply salt and pepper generously. Roast 12 minutes or until the asparagus is cooked (thick spears will take longer). While the asparagus cooks, melt the butter in a small saucepan on MEDIUM until it browns a bit - watch carefully, once the butter starts to brown, it can burn quickly. (I had to make it twice tonight.) Remove the butter from the stove and stir in the soy sauce and balsamic vinegar. Pour over the cooked asparagus and serve. I like your blog and I will come back. This recipe is originally from Cooking Light magazine. It is absolutely fabulous!